With organic ingredients and ethical formulas, Norabloom Botanicals has been a line I've been itching to try out for some time now. Created by esthetician and makeup artist Holly Green, Norabloom is not only a line of fantastic green products but is also the name of Holly's wonderful beauty lounge, a spa offering all kinds of skin treatments, including oncology skin care. These treatments include products from Norabloom's own line to provide speciality skin care that is gentle enough to be used on cancer patients who are either in the process of undergoing treatment or post-treatment. As someone who has seen many loved ones go through cancer treatment (which, sadly, is all to common for many) and the effect it has on their bodies, I am fully in support of a spa that can provide specialized services for those that need it. Anyways, everything about the background of this brand is fantastic and made me all the more excited to try out their products for myself. 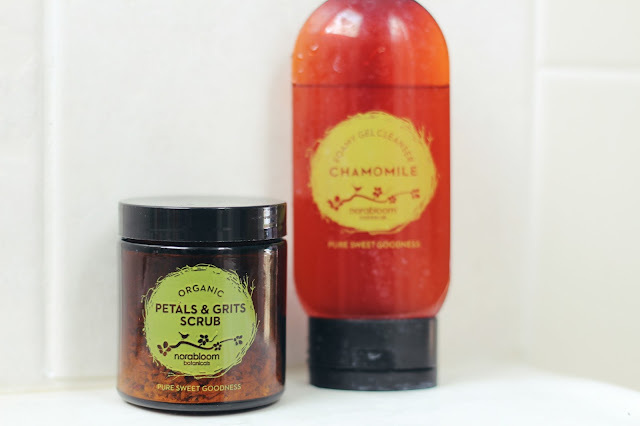 I've been using their Petals and Grits Scrub* as well as their Chamomile Foaming Gel Cleanser* for a few weeks now and am happy to say that they are as gentle as they are effective. Their cleanser is a beautiful foaming gel that can be used on all skin types, but especially oily and congested. While my skin isn't particularly oily it is unfortunately congested. With ingredients such as chamomile and lactic acid this is truly a high-performing option for those looking to cleanse their skin. I often use it in the morning and find that it leaves me with a beautiful squeaky-clean complexion that is perfect for the day ahead. I especially love using their cleanser combined with their scrub. The scrub is made with a unique homemade blend that includes organic grits and cornmeal, honey powder and freshly dried herbs. The two products pair perfectly together, giving you a cleanser and gentle exfoliant in one. I find that using both leaves my skin both clear and refreshed, erasing both dry patches and congestion at once. Truly a one-two punch that my skin has greatly benefited from. Have you guys tried Norabloom Botanicals yet? Be sure to follow them on Facebook, Twitter and Instagram for gorgeous pictures and some fabulous skincare tips from the experts.